This all cooked up really quickly, using only ingredients I had in my house. I keep frozen shrimp in the freezer for quick pastas, etc. I also LOVE those tubes of lemongrass and red pepper paste because I can’t use up a whole bundle of fresh stuff, but these tubes store in the fridge for a while! I don’t really do exact measurements (what fun is that?? ), so I’ll just guess below. The marinade shouldn’t be runny, more like a paste that coats each shrimp, adjust the liquid ingredients accordingly. I marinated them for about 20 minutes. I’m sure they would have been even better had I not been starving (thereby rushing them). To cook the shrimp, I’m sure you could skewer them and grill them, but I just sautéed them in a med-hot pan. The olive oil from the marinade made it so that I didn’t need to oil the pan first. I also made some quick-cooking polenta and mixed in a little bit of butter, skim milk, cheese (Mexican blend) and chopped green chilies. I served the shrimp on top of the polenta and had a side of black beans with lime juice and jalapenos. It was a nice spicy dish, but it wasn’t overly hot. You could adjust the amount of red chili paste and chalula to tone it down a bit. It went well with a light Rose I already had open. In honor of Fat Tuesday and my memories of New Orleans eating, I made a super quick version of red beans & rice. 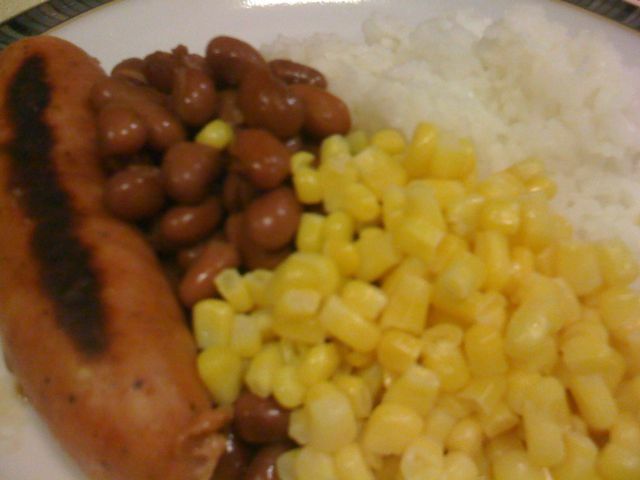 To spice up the classically Cajun dish – without actual spices (we’re a heartburn house) – I combined rice, beans, corn and Aidells Chicken Apple sausage. Preparation couldn’t have been easier; rice from the rice cooker, frozen corn in the microwave, and organic red beans from a can. Just heat the sausage in a saute pan until warm throughout (about 10-12 min. 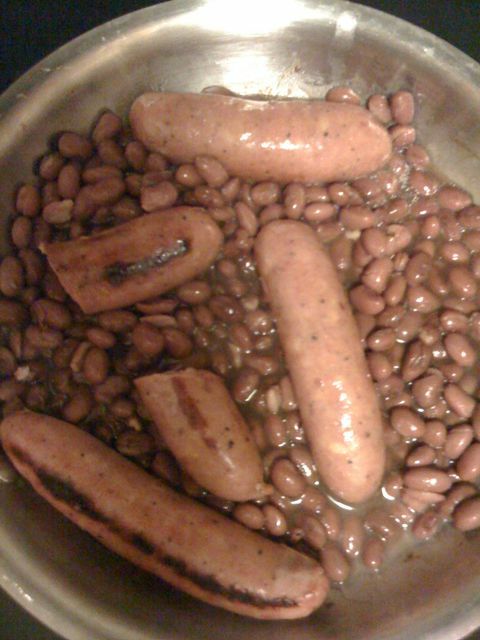 ), add the beans and turn the heat down to medium-low for about 5 minutes until heated. Combine with corn and rice, and serve. I recommend seasoning with butter, salt, and pepper; but David had his with a little yellow mustard. I used 1% milk instead of 2% – other recipes call for whole milk (and other cuts of pork, for that matter). Don’t turn the heat down too quickly after you cover the browned meat with milk. I lost the boil and had to turn the heat back up to get it to simmer, which resulted in a mess of a stovetop! The first time I boiled the milk down it seemed to take a lot longer than a half hour (suggest medium-high). Pour the sauce over the meat – and mix in a cup’s worth in mashed potatoes, like I did! The meat was incredibly tender, and delicious with creamy mashed potatoes. The pork tenderloin that’s been sitting in my freezer for five months is another (questionable) option. I found this helpful guide from Real Simple that told me it’s still safe to eat. Tonight’s menu TBD, but will likely involve pork. Quick and simple: brown a package of ground turkey, add 1 taco seasoning packet (or diced onions for lighter flavor) and water, simmer. Then heat tortillas with wet paper towels, or taco shells, in microwave until pliable (2 minutes). Fill with favorite toppings: shredded cheese, diced tomatoes, lettuce, sour cream, black beans, etc. On the second night, use the leftover meat to make a delicious taco salad with same ingredients, plus salsa or ranch dressing.